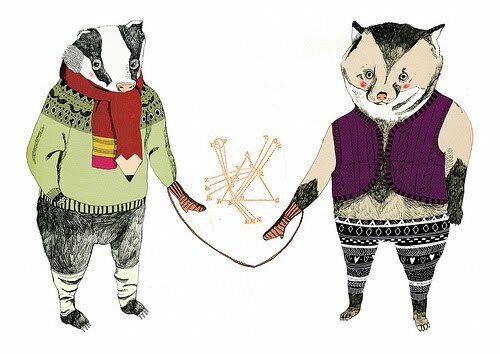 For this month’s blog interview we've spent some time with the delightful artist/illustrator, Julia Pott. Julia’s work, which graces everything from cards, canvas bags and fake (and real) tattoos to uber-cool music videos and heart-wrenching short films, is intriguing and captivating, never failing to provoke an emotional response. Julia's My First Crush animation had us swooning! 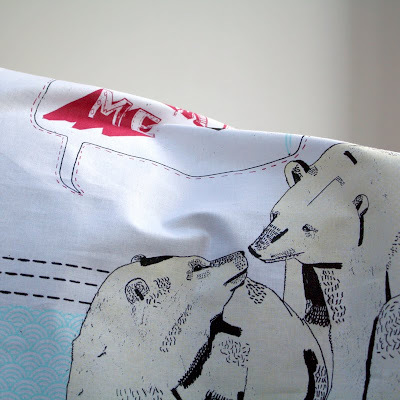 We were over the moon when Julia agreed to work with us last year on Bake Me, the first tea towel in our ToDryFor range! Tell us a bit about yourself... Who are you and what do you do? Hello! I'm Julia Pott and I'm a freelance animator and illustrator. Have you always wanted to work primarily in animation? I think deep down it was definitely always the plan. I used to tell people when I was little that I wanted to be a cartoonist for Disney. Sure I was 5 years old and didn't really know what that meant but I said it none the less so it must mean something! What was the first animated film/cartoon that you remember making you think ‘I want to do that’? I think it really clicked when I was working on my second project at Kingston. It was just a small 'animatic' project where you had to design your own character and make it move in the context of a story. I think I was really tired that day and just messed around on the lightbox, thinking there was no way the animation was going to work..and it did! And it was so so satisfying to see it moving, I was hooked. What fun projects are you currently involved with, and which has been your favourite project to date (if you can choose)? I can't really talk about what I'm working on at the moment, but it's an exciting project! It's definitely hard to say which project was my favourite to work on so far. My First Crush was definitely a memorable experience as it was my first short film, my first real animation really, and I learnt so much from it. The Decemberists was also a rad project, I had so much freedom to create a 16 minute animation for such an amazing album. And I was flown out to LA at the end of it, which isn't bad at all! We really love the fact that your work personifies animals. 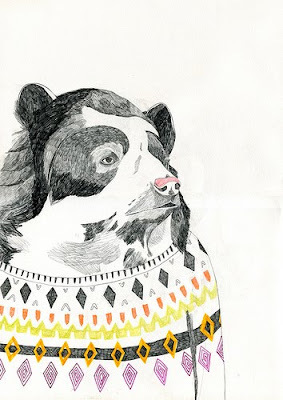 If you were an animal, what kind of animal would you be? Ha, um...I'd love to be a red panda or a fennec fox..because they're so soft and so cute. But I imagine if I actually WAS an animal, I'd probably be some kind cat. I tend to be a tiny bit closed off, like a cat who won't let you pick them up. I'm also very clumsy and from watching a lot of cats, they tend to be too! Your work lends itself incredibly well to music videos. What kind of music do you listen to and who would be your favourite band/musician to work with? Oh thank you! 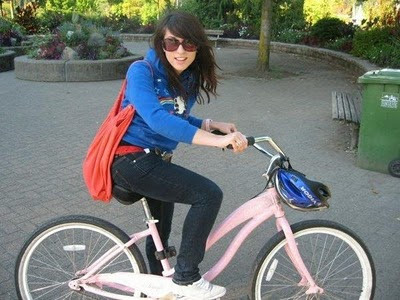 I'm a big music lover, I listen to a lot of Leonard Cohen, Of Montreal, CTFPA, Beach House, Radiohead, Hot Chip, Frightened Rabbit and when I'm feeling a little bit like I need some energy I put on the ridiculous hip hop music. I was actually really lucky and I got to work with one of my favourite bands a few years ago, Of Montreal, but only as an animator not a director, so I think I still hold a desire to make a video for them. Also Beach House would be great, or Metronomy. New York v London? Coffee v Tea? M&Ms v Smarties? You get the idea... where do you feel more at home? New York! Tea! M & M's! Ha I guess Tea is a bit of a wild card there. Iced Tea is quite American I suppose! I definitely feel more at home in New York, without a doubt. My mom is from new york and I have a lot of family over here and I really enjoy the way of life over here. What book are you reading right now (and do you doodle in the margins)? At the moment I'm reading Kafka's 'Metamorphosis and other stories'. I really love short stories, I draw a lot of inspiration from them about how to structure short films. I'm afraid I'm not a doodler, but I don't take very good care of my books, they always looks very disheveled! Good question! I'm hugely into Jamba Juice at the moment, it's a smoothie chain in the states that does this epically good smoothies that taste slightly like milkshakes. Just today I bought a 40 oz berry shake and dropped it as soon as I got on the train..it was a very embarrassing disaster! I also just started playing tennis again and it's rad, I love it! And one of my new found obsessions is toast with cream cheese and jam on it, can't get enough! It makes it taste like cake! And finally, who does the washing up in your household (and do they dry the dishes with your Bake Me tea towel)? My mom always said that I was supposed to be born a boy because I am quite boy like in nature. I can't cook, and I avoid washing up like the plague! So I do do the washing up because I live alone, but more often than not the plates will have developed a pretty gnarly crust before I get to them. The Bake Me tea towel I have is still wrapped in plastic I'm afraid, I'm too precious about it to use it on my scummy dishes, ha! 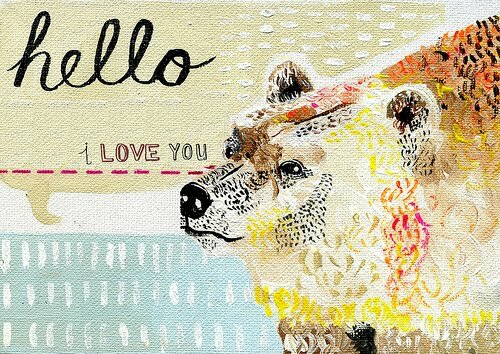 If you fancy finding out a bit more about Julia, and to see more of her amazing animations, why not check out her website, blog and etsy shop?!! Deck the halls with boughs of holly, fa la la la la, la la la...erm...huh hum... Sorry, we're so excited we actually thought it was Christmas for a split second there! We squealed (yes, Dave as well - he has quite a girly scream) when we saw what our postman had brought to us this morning. 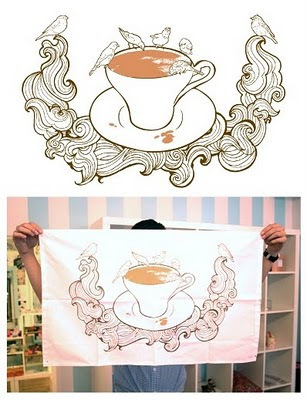 We flipped through the pages of the recent issue of Living etc to reveal one of our ToDryFor artist-commissioned tea towels featured in a fantabulous double-page spread (on pages 26-27)! Beautifully framed by John Jones of London*, Rob Ryan's breathtaking Heaven design looks equally glamorous when it's drying the dishes! 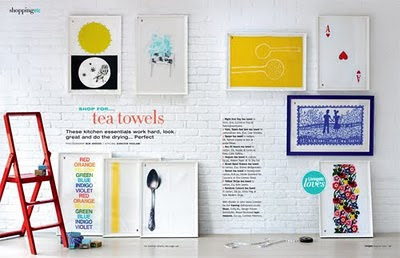 * John Jones worked with Living etc to frame 9 tea towels which have been presented as works of art in their own right. The frame designs were kept simple and fresh. Rob Ryan’s Heaven design was chosen to activate the whole arrangement in a hand coloured, ornamental dark blue frame. John Jones have recreated the Living etc feature in their main exhibition space in London, which will be on view until the end of August. 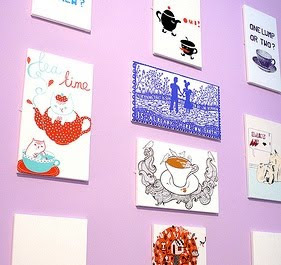 The exhibition delights in everything to do with tea, exploring its links with countries and cultures throughout history, tea-drinking customs around the world and, best of all (we think), it encompasses tea-related paraphernalia. That can only mean one thing... you guessed it, tea towels!! 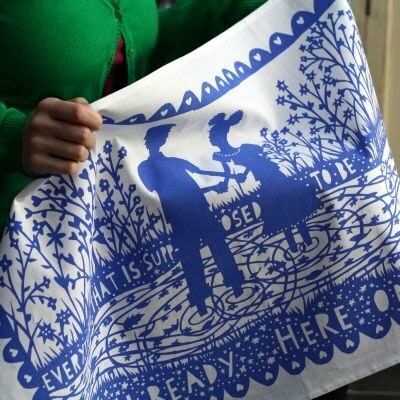 Geo's Bird Bath tea towel is on sale in Museums Sheffield's shop, and is also available here via ToDryFor.com. Teatopia runs from 1st July - 24th October 2010. Why not make it a date and go for afternoon tea and cakes whilst you're there?